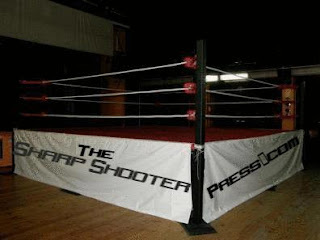 Since 2011, Sharp Shooter Press has presented a Year End Awards, commemorating the best in Professional Wrestling over the past year. Collaborating with other websites all over the net, the best minds in wrestling come together in order to determine the best of the best. Working three months in advance while observing all year long, the crew works diligently on making these awards as efficient and accurate as possible. In the end, two awards are presented; one chosen by the fans and one selected via a poll from the Sharp Shooter Press audience. Below, is the 2011 Pro Wrestling Year End Awards as well as some stats as to some individual facts about the awards. As of 2011, CM Punk has been presented the most awards, as he was involved with eight different awards. More will come in the near future! This award was one far more difficult to decide on than one may think. With the likes of YAMATO and Kevin Steen having phenomenal years, it simply came down to who had the biggest impact on the wrestling industry in 2011. The answer, CM Punk. To be brief, Punk made wrestling cool and exciting to watch again, which had made WWE once again socially relevant and brought in new viewers worldwide. Finally being bestowed the microphone he so desperately wanted, several pipe bombs were dropped that have been deemed some of the best of all time. From his six minute initial shoot on Viewer's Choice to his embarrassment of Vince McMahon at the live contract negotiations, Punk made wrestling fun, interesting, and unpredictable. Not only was his mic work great, his in ring ability was proven time and time again with fantastic encounters with Randy Orton at Extreme Rules, Rey Mysterio at Over the Limit, and against John Cena at Money in the Bank. He skyrocketed to the top and made wrestling intriguing for the first time in years. To once again say this was an easy choice to make would be a gigantic lie. From initially choosing between 25 epic encounters, it was very difficult to determine what match should define 2011. However, it came down to CM Punk and John Cena's earth shattering match at Money in the Bank. What makes a great match to me is one that is built up well, unpredictable, intriguing, and obviously well wrestled in a great atmosphere. This bout fit the description to a "T." The Chicago crowd had been one of the best crowd's in WWE history and was the same on July 17th throughout the evening. However, they turned it up a notch in the main event when the hometown hero came home for one final hurrah to take the championship away from John Cena and the WWE. Giving credit where it is due, John Cena played his role perfectly, and proved the naysayers wrong by wrestling an awesome match. The story these two men told was one of a kind and unique, which is a rarity in WWE today. From the roaring entrance to CM Punk blowing a kiss to Vince McMahon before running out of the arena and placing the title in his fridge, this is a match that transcends time and is one of the best matches ever in WWE history. In a tight race with Austin Aries for this award, Mark Henry edges him out simply due to the impact he had in 2011. At the end of 2010, Henry admitted that he was not at his best and wanted to retire after the coming year. Fast forward and that forgotten quote has become a thing of the past for the former World Heavyweight Champion. After ten plus years in the WWF/E, Mark Henry finally was given his opportunity and ran with it. Being drafted to Smackdown and turning heel once again, Henry unleashed the inner monster that nobody expected to see coming. Getting into the shape of his life and truly unleashing this monster led to Mark Henry winning the World Heavyweight Championship for the first time in his long career. After holding the belt for a good portion of the year, Henry was dominant, but had some memorable matches with Big Show, Randy Orton, and Daniel Bryan. The monster proved his mic work was not the only thing that improved heavily, but that his in ring ability was one great for a monster. Although he is cooling off at the end of the year, we can not forget his monstrous reign of terror over Smackdown from April to November. He turned around his career like no other in 2011 and it'll be interesting to see what is next in 2012 for the 400 pounder. Another award the fans agree on with the committee, Gregory Iron's experiences in 2011 have been unlike the majority. Dealing with cerebral palsy since he was a boy, Iron always dreamed of being a Professional Wrestler like his hero, Hulk Hogan. Bursting onto the wrestling scene a couple years back, Iron wowed audiences of all ages with his wrestling ability with one arm. He may not be the flashiest or the most technically sound in the world, but there is amazing ability and heart in a man that went through all he did and went to live his dream. Gaining his most exposure in 2011 on a worldwide scale, Gregory Iron was in a bout featuring Colt Cabana at an Independent wrestling promotion. However, the real story came after the match in which Cabana brought out the newest wrestling free agent, the WWE Champion, CM Punk out to face Mr. Iron in the middle of the ring. Punk got on the microphone, praised Iron, and hoisted him up with Cabana for a standing ovation. There are times where wrestlers bring so much good into the world throughout their good deeds, and there was no moment as heart warming as the WWE Champion praising a man who is living his boyhood dream. Coming with all the good that occurred in Pro Wrestling in 2011, it was also a year of deaths and tragedies. From the further downfall of the once great Razor Ramon to the spiral of the Hardy brothers, the death of Randy Savage seems to take the cake. Known as one of the greatest workers of all time in the ring and on the microphone, Randy Savage was a one of a kind talent. Being a six time world champion, Savage was known for his unique attire, move set, and way of talking on the microphone. His passion and individualism had touched the hearts of millions and is still today one of the greatest wrestlers of all time. In 2011, it seemed all was heading in the right direction with WWE, as he was promoting merchandise and being featured as an action figure and a video game character for WWE, many felt 2012 was going to be the year he was finally inducted into the Hall of Fame. However, he died in his car via heart problems and met his fate before he would ever be inducted into the Hall of Fame. In 2012, it is still a possibility, but it will never be as special as it would have been if he could have delivered one more promo to the masses in attendance. "Macho Man" was one of a kind and will always be remembered as a late great legend, that raised the bar for all to come after him. The "Summer of Punk" completely had circled around Vince McMahon and the WWE. Being tired of the likes of John Cena being shoved down the audiences' throats as well as the cookie cutter bodybuilders that seemed to have it all in the WWE, Punk was the first to finally stand up and demand the true wrestlers deserve respect and opportunity. Acting as the "Voice of the Voiceless," Punk held McMahon and WWE in captive by threatening to leave the WWE with the prestigious WWE Championship when his contract expired at Money in the Bank. Due to his lack of faith in Cena, McMahon tried to meet the demands of Punk, but to no avail as he ended up deciding to leave WWE after his last match in his hometown of Chicago. This feud was "the feud" to watch this past year and viewers tuned in week after week in hope of Punk deciding to re-sign with the company that he was putting back on the map. Vince McMahon and his corporate stooges realized the threat of CM Punk and their encounters in the ring together were historic. From the live contract negotiations to pushing the buttons of new COO, Triple H, Punk had the entire WWE at his knees begging not to leave. The magic made in this feud and the brilliant work of all involved made wrestling edge of your seat programming again, thus making it the feud to see in 2011. Once again with stiff competition, Punk unanimously takes this award for being the best talker of the year. Although Kevin Steen and Jon Moxely brought some deep consideration, Punk once again wins for the sheer impact of his mic work. Even dating back to his feuds with Randy Orton and others, Punk brings a unique and one of a kind approach to the microphone, making wrestling seem as real as it can. His edge, humor, and ability to understand the audience is something the WWE has not seen in many years. Throughout the entire year, Punk's words have become synonymous with greatness and change to the WWE. Deeming himself a catalyst, Punk wants to be the voice of a new generation and believes that his words can be as strong as his actions. Leading all the way to the "Summer of Punk," Punk revolutionized the wrestling industry in 2011. His "pipe bombs" spread all over the media and have been used by many all over the nation in 2011. Punk broke from the WWE boundaries this year and was allowed to be himself, proving that you are always at your best when the leash is loosened. Punk's words with the likes of John Cena, Triple H, and Vince McMahon were groundbreaking and breathed a breath of fresh air to a dull company. If that isn't enough reason, then I don't know what else is. While there is some question about Davey's charisma and ability to tell a story in the squared circle, there is no doubt Davey Richards was arguably the best in ring performer of 2011. The ROH World Heavyweight Champion tore the house down with tag team partner, Eddie Edwards on two separate occasions and had some phenomenal encounters with Prince Devitt, Chris Hero, Low Ki, Ryusuke Taguchi, and countless others. Davey Richards comes off as, as real as it gets in the world of Professional Wrestling. Training like an MMA fighter and tearing the house down realistically every single night, there is no wrestler out there who has been as consistent and technically sound as Davey Richards in 2011. Holding the ROH Championship for six months and still going strong, Richards has proved time and time again that he just may be the best wrestler in the world today. So many memorable encounters all over the nation, Richards proves that wrestling is not just sports entertainment, but it is a real sport despite predetermined results. While the likes of Daniel Bryan and Dolph Ziggler proved to be great this past year, Davey Richards has been the most consistent wrestler of 2011. In a very difficult decision, Dolph Ziggler edges out Cody Rhodes and Alberto Del Rio to win this award. Although he did not go through all the gimmicks Cody Rhodes did and he didn't have the paper year that Alberto Del Rio did, Ziggler looked the best consistently on the upper mid card scene. The problem with Alberto Del Rio is that although a Royal Rumble win, Money in the Bank win, and two WWE Championship reigns looks awesome on paper...things didn't turn out to be as great as they look for the Mexican Aristocrat. His title reigns lacked much of anything and his Royal Rumble win was anything but dominant or impressive. Dolph Ziggler, on the other hand was in the World Heavyweight Championship match at the Royal Rumble and had some very admirable title reigns in 2011. Capturing the World Heavyweight Championship, albeit for 11 minutes and an impressive run with the United States Championship. Solidifying himself as a true threat in feuds with the likes of Edge, John Morrison, Kofi Kingston, and even Zack Ryder, Ziggler was a standout in each and every one of his performances. Improving drastically on the microphone throughout the year, it was evident 2011 was the breakout year for one, Dolph Ziggler. Now, starting this year in a title match similar to last year, Ziggler is looking very good for his 2012 campaign. He may not be perfection, but he is not far from it. WSU Champion since 2009, Mercedes Martinez had nothing short of a great year in 2011. With a streak of great matches, including an unprecedented 73 minute bout with Lexxus, which will go down as a world record for the longest wrestling match to date. Her mic ability has been very solid, proving to be arguably the best woman wrestler in the world with some competition from Sara Del Ray and Hailey Hatred. However, Martinez takes the award this year for her five star caliber matches and one of the longest title runs in the modern history of Professional Wrestling. Proving the women can bring great matches and entertainment in the same way the men can, Martinez is a primary example of a phenomenal all around talent from the female gender. Martinez had a phenomenal year and looks to continue her dominant reign in the next year of 2012, full of new challenges in WSU. Facing steep competition with The Colony, Claudio Castagnoli and Chris Hero edge it out to become the team of 2011. Having the JCW Tag Team Championships until being stripped of them in February, as well as holding the ROH Tag Team Championships for almost a year, the longest reign in the promotion's history to date. The Kings of Wrestling proved that they are still the best team in Professional Wrestling. Having a streak of strong defenses and some fantastic bouts, before eventually dropping the straps to Shelton Benjamin and Charlie Haas in April. Although not carrying the belts for much of the 2011 year, their strong reign proved enough about how good these two are in great matches against the likes of Future Shock and the American Wolves. Throughout the rest of the year, the Kings had stayed in the hunt for gold and had many high aspirations, but rumors soon swirled of the two heading to WWE. As of right now, it seems as though only Claudio will be heading toward the WWE, thus breaking the duo up. However, for the first half of the year, the Kings of Wrestling were defining tag team wrestling all over, and that is enough to give them the award for 2011. Winning the Freedom Gate Championship from BxB Hulk on the first DGUSA show of 2011, YAMATO has proven to be the best champion of DGUSA for the year as well as one of the strongest champions of the year as a whole. Holding the title from January 28th to November 11th, losing the strap to Johnny Gargano, YAMATO had five awe inspiring title defenses, most notably against Austin Aries ad Akira Tozawa. YAMATO proved that even today, long reigning champions can be entertaining and fun to watch. His series of matches over a span of nine months never got old and created a legitimate champion in YAMATO, something rarely seen on the mainstream wrestling circuit. Even the night after winning the strap, YAMATO defended it the next two days afterward, successfully. Proving to be a strong champion, YAMATO was one of the standout performers in DGUSA over the course of the past year and proved that long reigning champions are not a thing of the past. The show that featured the growth of CM Punk, the return of The Rock, and several other top stories of the year was brought to us by the premier show in sports entertainment, Monday Night Raw. Facing little to no competition in this category, as ROH struggled to an extent moving their product to television as well as many other programs being taken off the air, Raw was absolutely the show that had everyone talking in 2011. Featuring John Cena, CM Punk, Randy Orton, and many others at one point or another over the year, Raw featured the best storylines and matches of the year. We witnessed the matches like Miz vs Morrison, Ziggler vs Punk, and a great 12 man tag team match all on the show to name a few matches and storylines such as the "Summer of Punk" and the slow transition toward a possible Cena heel turn has caught the interest of fans of all ages. We saw The Rock make his longtime return as well as celebrity appearances by Hugh Jackman and The Muppets. Sure, we saw some flops on Raw such as the "Walkout" on Triple H as well as the disappointing climax of CM Punk's return, but all in all it was a good year for WWE's A show. Raw got us talking and has been turning around greatly since the 2009 disaster year and 2012 will be a very interesting year as we head into one of the biggest WrestleManias in history. One of the best feuds of the early part of 2011 was all thanks to Randy Orton and Christian. Once a very hot feud, it all came into fruition five days after Extreme Rules, where Christian captured the World Heavyweight Championship for the first time. After five days with the title, he was forced to defend it against Randy Orton and lost the title. This would lead to months of epic encounters featuring these two men. 2011 was a huge turnaround year for Orton, who proved his haters wrong as well as Christian, who proved he could hang in the main event. One could argue their 20 minute long bout on Smackdown had been their best match. Although no surprise to those who read the spoilers, the feeling was electric as to the unpredictability of the match and the story told during and after the match. This was a bout that deserved PPV recognition and it all ignited a longlasting feud between the two. Once about respect, then turned into a brutal hatred, both men put on one heck of a match on Smackdown that truly was on of the best televised matches in years. The more I thought about this, the more I thought it was unfair that CM Punk would win an award for a gimmick that was essentially just being himself. The "Voice of the Voiceless" shtick was great, but is it really a gimmick? That is what went on to sidetrack me and although some may disagree, I felt Sami Calliahn was deserving of this award for his excellence behind such a great "New Horror" gimmick. From his unique look to his crazy cryptic promos, Sami Callihan has delivered in every which way in order to make this gimmick arguably the best wrestling gimmick in the world today. The delivery and execution of a gimmick is one that Callihan perfected in "New Horror" and it really rings to me as an Undertaker-like gimmick, but modernized into something that could work in 2011. This year, Callihan continued to up his game to new heights with phenomenal matches with Fit Finlay and others, but his eerie approach to his gimmick is one of true genius. Because the gimmick is so unique and so perfectly executed, it is apparent that he is more than deserving to win this award. Regarded as one of the most memorable shoot promos in recent memory, CM Punk let six years of pent up frustration go and it shook the very foundation of the industry. Wearing a "Stone Cold" Steve Austin t shirt and sitting on the ramp, Indian style, Punk revealed his master plan to take the WWE Championship, while trashing the WWE higher ups, John Cena, and the fans. Punk spoke his mind and overnight, Punk was a star. National media took it to attention and Punk once again made WWE socially relevant and something everyone wanted to talk about. As soon as Punk's mic was cut off, the masses wanted to know his stories and this all capped off the summer that Punk had in 2011. The sheer brilliance and impact this promo had is without a doubt the best segment of the year. After all the Punk talk thus far, it really isn't worth talking about it as much as it is worth seeing for yourself and reliving what really ignited this story. Despite so many good (i)PPV events taking place all over the nation this year, the Chicago crowd really made Money in the Bank feel like one of the greatest PPV events of all time. Featuring two solid Money in the Bank ladder matches, with the Smackdown brand really standing out to be one of the best MITB ladder matches, the show did not lack any excitement, shock, or pure emotion. Randy Orton and Christian also provided a very solid bout, despite a lackluster finish to give Christian his second reign with the World Heavyweight Championship. Mark Henry and Big Show also delivered in their one on one bout as well. However, the real draw was the main event between John Cena and CM Punk. The emotion, adrenaline, and passion from the Chicago crowd on top of the awesome matches presented make Money in the Bank the most memorable PPV event of the year. This is definitely an even you want in your DVD collection to relive for years to come.CM Punk's breakout match as well as Mark Henry's dominance and the boyhood dream of Daniel Bryan were all seen and executed throughout the event, making it one of the best in recent memory. As voted by Sharp Shooter Press and the fans, Zach Gowen earns the award of Interview of the Year and A.J. Kirsch is awarded with the fans' choice for the interview of the year! Congratulations to both and check both out if you haven't already! Their stories are shared in open and candid conversation, which was the cream of the crop in the Sharp Shooter Press this year.